The December 2007 IDC and IDCS courses have started. Yesterday Paul and Miro started their IDCS course and today Will, Sophia, Rob and Joakim started their prep IDC course. Sophia during her Introduction of the IDC, where each person participating in the IDC get's to introduce him or her self. A view from the front, from the left front to back; Sophia, Joakim, Paul and from the right front to back; Will, Rob and Miro. Today we started with sorting out lots of red tape (aka paperwork, like filling out Liability releases etc), explanation of the IDC and IE, the Introduction presentation and an exam (physics). In the afternoon we had a Confined Water dive were the 20 skill circuit was practised and they got re-acquainted with Rescue diver course exercise # 7, unconscious diver at the surface. 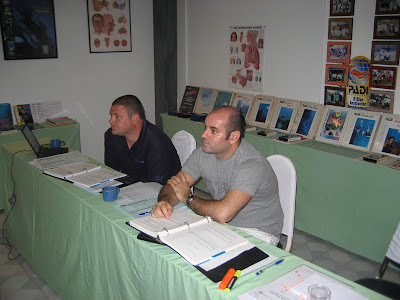 A closer look on Paul (left) and Miro(right) whilst they're studying hard during their IDCS course. 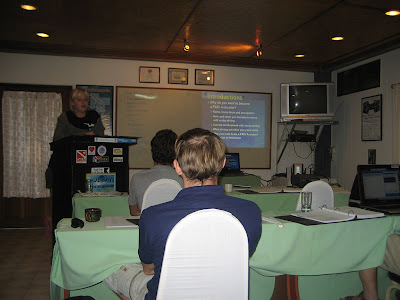 During the course I will give some updates and during the PADI IE, which will be held on Koh Tao this time, you will find out how they're doing.